Over the past year, we have seen a lot of interest from partners and customers in our Warrior families of MIPS CPUs. Today I’d like to reveal some of the progress we’ve made with the 64-bit MIPS I6400 processor which is now gaining traction across a range of applications. 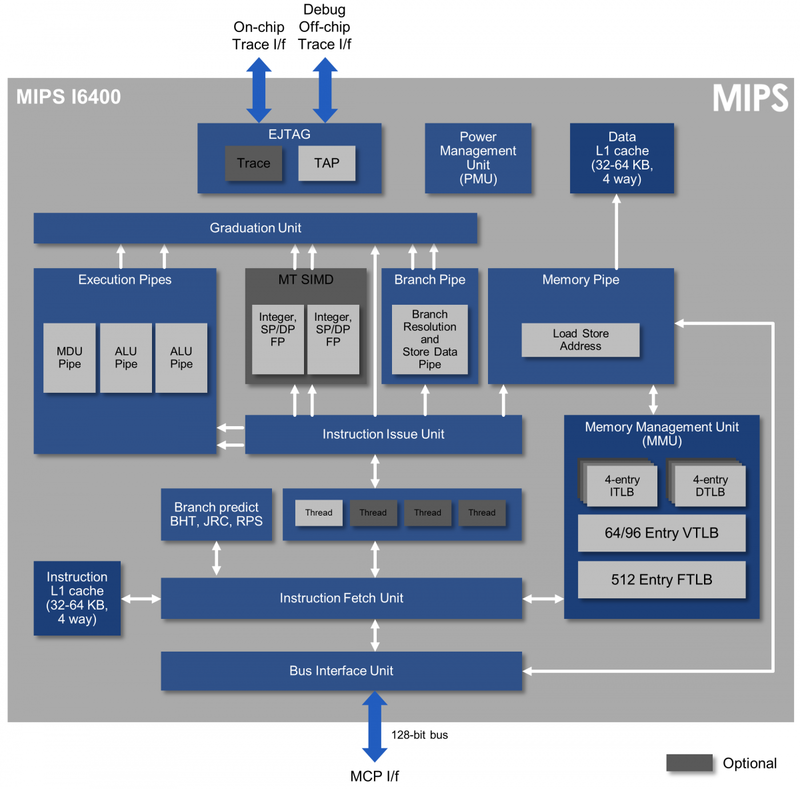 The I6400 processor implements MIPS64 Release 6 (the latest version of the 64-bit MIPS architecture) and includes a unique combination of features such as hardware multi-threading, hardware virtualization and 128-bit SIMD that provide significant advantages for SoC designers. One way in which I6400 licensees are achieving differentiation is by taking advantage of our hardware multithreading capabilities. Imagination’s own internal benchmarking tests show the clear performance boost delivered by simultaneous multi-threading (SMT): by adding a second thread, the performance achieved on popular benchmarks like DMIPS, CoreMark and SPEC increases by 30-60%. For common operations like data movement (memcopies), a single-core, quad-threaded I6400 delivers a 200% gain in relative data throughput compared to a single-core, single-thread configuration. In addition, the combination of SMT with hardware virtualization leads to even greater benefits by eliminating the overhead normally associated with running multiple guest operating systems on a single CPU – while maintaining fast, deterministic response for real-time systems. This can be a big advantage in numerous implementations, such as a system running both an RTOS and Linux to accommodate open and closed environments for software development. The hardware virtualization in MIPS I6400 CPUs also provides a foundation for implementing our OmniShield™ multi-domain security technology. Included in the latest MIPS Warrior CPUs and other Imagination processor IP families (e.g. PowerVR Series7XT and Series8XE GPUs), OmniShield uses hardware virtualization at the system level to isolate applications in isolated and trusted environments, providing a foundation for security by separation. In conclusion, we’re really pleased with the uptake we are seeing for our entire line-up of MIPS I-class CPUs, including the various Warrior and Aptiv configurations. Our I6400 customers are reporting clear differentiation in their initial implementations, which we expect to see rolling out to the market in the coming months.